When it comes to school lunches and snacks, it's important to give your kids things they like, otherwise it just won't get eaten. I threw an awful lot of food in school because my mom insisted that I take something that I didn't like. So, I would just not eat which meant I didn't always have the energy I needed to learn. 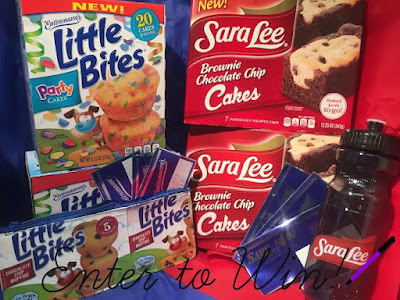 Entenmann's Little Bites and Sara Lee Snacks come in easy to grab portions that are perfect for tossing in a lunch box as a nice treat. 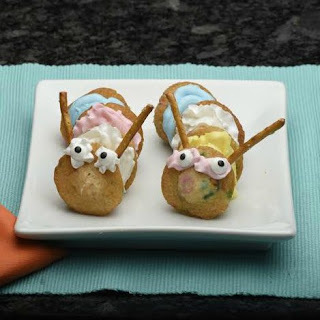 For an After School snack, why not let your kids play with their food, so it's not just eating, it's an activity that allows them to use their creative skills. The video below gives some great tips including how to make this Party Cakes caterpillar. The other great tip is to give your kids a "menu" to plan their lunches for the week. They select what they want for treats for the week. This makes it so much easier on you and it gets them a choice in what they are eating. With the colorful sprinkles in the Entenmann's Party Cakes, they would also be perfect as treats for a unicorn themed party. They're fun like unicorns and glitter! 1 Reader will win the same prize pack I received. It contains 2 boxes of Entenmann's Little Bites Party Cakes, 2 boxes Sara Lee, coupons, recipe cards, water bottle, and a pencil pouch. $60 value. Just complete the form below to enter to win. Disclosure: I received product for free in exchange for this post. All words and opinions are my own. Prize for winner is supplied by Sara Lee Snacks and Entenmann's Little Bites. This site uses affiliate links.